An explorer at heart, she has lived and worked in various countries in Europe, the Middle East and Asia, and is widely travelled – feeding a strong desire to know other cultures. She has a keen interest in the intermingling of the arts with the sciences and technology (high/low/fast/slow), to achieve the delicate combination from which poetry emerges. Jodie is also a writer/editor/translator collaborating with architects, artists, playwrights, designers, musicians, performers, etc. on projects across Europe, as well as on books and publications. 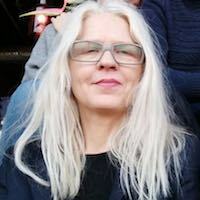 Prior to living in Prague she founded and directed a nomadic platform for the arts in Brussels, presenting performance, music, and visual arts exhibitions, often in parallel. In her free time she creates projects ranging from 3D poetry to scripts for plays, and is currently learning to play the piano.